Trying to get a handle on 2D graphics rendering performance can be a difficult task. Obviously, people care about the performance of their 2D applications. Nobody wants to wait for a web browser to scroll past tacky banner ads or for an email client to render a screen full of spam. And it's easy for users to notice "my programs aren't rendering as fast with the latest drivers". But what developers need is a way to quantify exactly what that means, in order to track improvements and avoid regressions. And that measurement is the hard part. Or at least it always has been hard, until Chris Wilson's recent cairo-perf-trace. These traditional benchmarks suites are collections of synthetic micro-benchmarks. Within a given benchmark, some tiny operation, (such as "render a line of text" or "draw a radio box"), is performed hundreds of times in a tight loop and the total time is measured. The hope is that these operations will simulate the workload of actual applications. Unfortunately, the workload of things like x11perf and gtkperf rarely come close to simulating practical workloads. In the worst case, the operation being tested might never be used at all in modern applications, (notice that x11perf tests things like stippled fills and wide ellipses which are obsolete graphics operations). Similarly, even if the operation is used, (such as a GTK+ radio button), it might not represent a significant fraction of time spent rendering by the application, (which might spend most of its time drawing its primary display area rather than any stock widget). So that's just the well-known idea to not focus on the performance of things other than the primary bottlenecks. But even when we have identified a bottleneck in an application, x11perf can still be the wrong answer for measurement. For example, "text rendering" is a common bottleneck for 2D applications. However, a test like "x11perf aa10text" which seems like a tempting way to measure text performance is far from ideal. This benchmark draws a small number of glyphs from a single font at a single size over and over. Meanwhile, a real application will use many glyphs from many fonts at many sizes. With layers and layers of caches throughout the graphics stack, it's really not possible to accurately simulate what "text rendering" means for a real application without actually just running the actual application. And yes, I myself have used and perhaps indirectly advocated for using things like x11perf in the past. I won't recommend it again in the future. See below for what I suggest instead. What do the 3D folks do? For 3D performance, everybody knows this lesson already. Nobody measures the performance of "draw the same triangles over and over". And if someone does, (by seriously quoting glxgear fps numbers, for example), then everybody gets a good laugh. In fact, the phrase "glxgears is not a benchmark" is a catchphrase among 3D developers. Instead, 3D measurement is made with "benchmark modes" in the 3D applications that people actually care about, (which as far as I can tell is just games for some reason). In the benchmark mode, a sample session of recorded input is replayed as quickly as possible and a performance measurement is reported. As a rule, our 2D applications don't have similar benchmark modes. (There are some exceptions such as the trender utility for mozilla and special command-line options for the swfdec player.) And coding up application-specific benchmarking code for every interesting application isn't something that anyone is signing up to do right now. Over the past year or so, Chris "ickle" Wilson has been putting a lot of work into a debugging utility known as cairo-trace, (inspired by work on an earlier tool known as libcairowrap by Benjamin Otte and Jeff Muizelaar). The cairo-trace utility produces a trace of all cairo-based rendering operations made by an application. The trace is complete and accurate enough to allow all operations to be replayed with a separate tool. The cairo-trace utility has long proven invaluable as a way to capture otherwise hard-to-reproduce test cases. People with complex applications that exhibit cairo bugs can generate a cairo-trace and often easily trim it down to a minimal test case. Then after submitting this trace, a developer can replicate this bug without needing to have a copy of the complex application nor its state. More recently, Chris wrote a new "cairo-trace --profile" mode and a tool named cairo-perf-trace for replaying traces for benchmarking purposes. These tools are currently available by obtaining the cairo source code, (either from git or in the 1.9.2 development snapshot or eventually the 1.10 release or later). Hopefully we'll see them get packaged up so they're easier to use soon. The cairo-perf-trace utility will replay several iterations of the trace, (waiting for the standard deviation among reported times to drop below a threshold), and will report timing results for both the "image" backend (cairo's software backend) and whatever native backend is compiled into cairo, (xlib, quartz, win32, etc.). So one immediately useful result is its obvious to see if the native backend is slower than the all-software backend. Then, after making changes to the graphics stack, subsequent runs can be compared to ensure regressions are avoided and performance improvements actually help. Finally, Chris has also established a cairo-traces git repository which collects useful traces that can be shared and compared. It already contains several different browsing sessions with firefox, swfdec traces (one with youtube), and traces of poppler, gnome-terminal, and evolution. Obviously, anyone should feel free to generate and propose new traces to contribute. In the few days that cairo-perf-traces has existed, we're already seeing great results from it. When Kristian Høgsberg recently proposed a memory-saving patch for the Intel driver, Chris Wilson followed up with a cairo-perf-trace report showing that the memory-saving had no negative impact on a traced firefox session, which addressed the concern that Eric had about the patch. 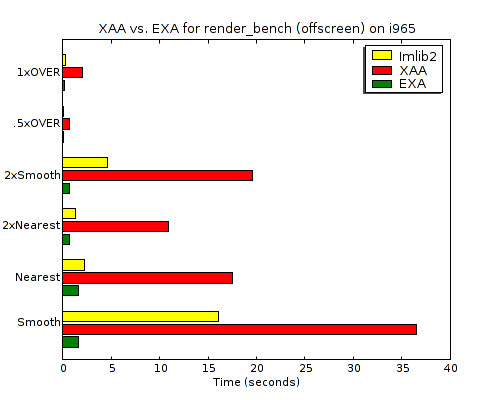 As another example, we've known that there's been a performance regression in UXA (compared to EXA) for trapezoid rendering. The problem was that UXA was allocating a pixmap only to then use software-based rasterization to that pixmap (resulting in slow read-modify-write cycles). The obvious fix I implemented is to simply malloc a buffer, do the rasterization, and only then copy the result to a pixmap. The performance problem is quite plain here. Replaying the swfdec trace to the X server takes 194 seconds compared to only 45 seconds to replay it only to cairo's all-software image backend. Note that 194 seconds is longer than the full video clip, meaning that my system isn't going to be able to keep up without skipping here. That's obviously not what we want. Many readers have heard already, but it will be news to some that I recently changed jobs. After just short of 4 years with Red Hat, I've now taken a job working for Intel, (in its Open-source Technology Center). It was hard to leave Red Hat---I have only fond memories of working there, and I will always be grateful to Red Hat for first helping me launch a career out of working on Free Software. Fortunately, as far as my free-software work is concerned, much of it will be unaffected by the job change. In fact, since I've been looking at X/2D/Intel driver graphics performance for the last year already, this job change should only help me do much more of that. And as far as cairo goes, I'll continue to maintain it, but I haven't been doing much feature development there lately anyway. Instead, the most important thing I feel I could do for cairo now is to continue to improve X 2D performance. And that's an explicit job requirement in my new position. So I think the job change will be neutral to positive for anyone interested in my free-software efforts. As my first task at Intel, I took the nice HP 2510p laptop I was given on the first day, (which has i965 graphics of course), installed Linux on it, then compiled everything I needed for doing X development. I would have saved myself some pain if I had used these build instructions. I've since repeated that exercise with the instructions, and they work quite well, (though one can save some work by using distribution-provided development packages for many of the dependencies). Also, since I want to do development with GEM, I built the drm-gem branches of the mesa, drm, and xf86-video-intel modules. That's as simple as doing "git checkout -b drm-gem origin/drm-gem" after the "git clone" of those three modules, (building the master branch of the xserver module is just fine). That seemed to build and run, so I quickly installed it as the X server I'm running regularly. I figured this would be great motivation for myself to fix any bugs I encountered---since they'd impact everything I tried to do. Well, it didn't take long to find some performance bugs. Just switching workspaces was a rather slow experience---I could literally watch xchat repaint its window with a slow swipe. (Oddly enough, gnome-terminal and iceweasel could redraw similarly-sized windows much more quickly.) And it didn't take much investigation to find the problem since it was something I had found before, a big, blocking call to i830WaitSync in every composite operation. My old favorite, "x11perf -aa10text" was showing only 13,000 glyphs per second. I had done some work to alleviate that before, and Dave Airlie had continued that until the call was entirely eliminated at one point. That happened on the old "intel-batchbuffer" branch of the driver. Recall that in January Eric and I had been disappointed to report that even after a recent 2x improvement, the intel-batchbuffer branch was only at 109,000 glyphs per second compared to 186,000 for XAA. Well, that branch had about a dozen, large, unrelated changes in it, and poor Eric Anholt had been stuck with the job of cleaning them up and landing them independently to the master branch, (while also writing a new memory manager and porting the driver to it). So here was one piece that just hadn't been finished yet. The driver was still just using a single vertex buffer that it allocates upfront---and a tiny buffer---just big enough for a single rectangle for a single composite operation. And so the driver was waiting for each composite operation to finish before reusing the buffer. And the change to GEM had made this problem even more noticeable. And Eric even had a partially-working patch to fix this---simply allocating a much larger vertex buffer and only doing the sync when wrapping around after filling it up. He had just been too busy with other things to get back to this patch. So this was one of those times when it's great to have a fresh new co-worker appear in the next cubicle asking how he could help. I took tested Eric's patch, broke it up into tiny pieces to test them independently, and Eric quickly found what was needed to fix it, (an explicit flush to avoid the hardware caching vertex-buffer entries that would be filled in on future composite calls). 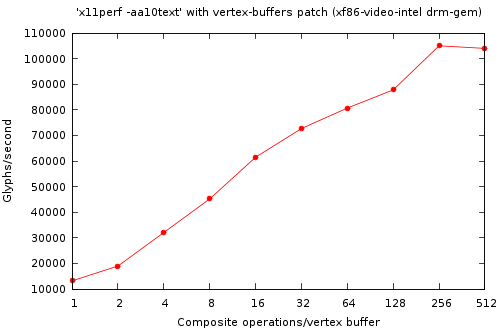 So the more the better, (obviously), until we get to 256 composite operations fitting into a single buffer. Then we start losing performance. So on the drm-gem branch, this takes performance from 13,000 glyphs/second to 100,000 glyphs/second for a 7.7x speedup. That's a nice improvement for a simple patch, even if the overall performance isn't astounding yet. It is at least fast enough that I can now switch workspaces without getting bored. So I went ahead and applied these patches to the master branch as well. Interestingly, without any of the drm-gem branches, and even with the i830WaitSync call on every composite operation, things were already much better than in the GEM world. I measured 142,000 glyphs/second before my patch, and 208,000 glyphs/second after the patch. So only a 1.5x speedup there, but for the first time ever I'm actually measuring EXA text rendering that's faster than XAA text rendering. Hurrah! And really, this is still just getting started. The patch I've described here is still just a bandaid. The real fix is to eliminate the upfront allocation and reuse of buffers. Instead, now that we have a real memory manager, (that's the whole point of GEM), we can allocated buffer objects as needed for vertex buffer, (and for surface state objects, etc.). That's the work I'll do next and it should let us finally see some of the benefits of GEM. Or if not, it will point out some of the remaining issues in GEM and we'll fix those right up. Either way, performance should just keep getting better and better. Stay tuned for more from me, and look forward to faster performance from every Intel graphics driver release.